The Mitsu-bishi 9000 HB was part of my NYC stationery haul. Since I have been back home in the UK I have been using and enjoying a range of pencils but the Mitsu-bishi 9000 is the one pencil I seem to reach for the most. There are numerous reasons that I have enjoyed using this pencil. Firstly it looks really great, the laquer on the pencil is a gorgeous shade of green. It comes with gold embossing that compliments the lacquer nicely. Unfortunately you do have the dreaded white barcode on one side of the hex which, as with other pencils, is unsightly. On one side of the pencil you have a note that the 9000 should be used for 'General Writing' which I think is an apt description. 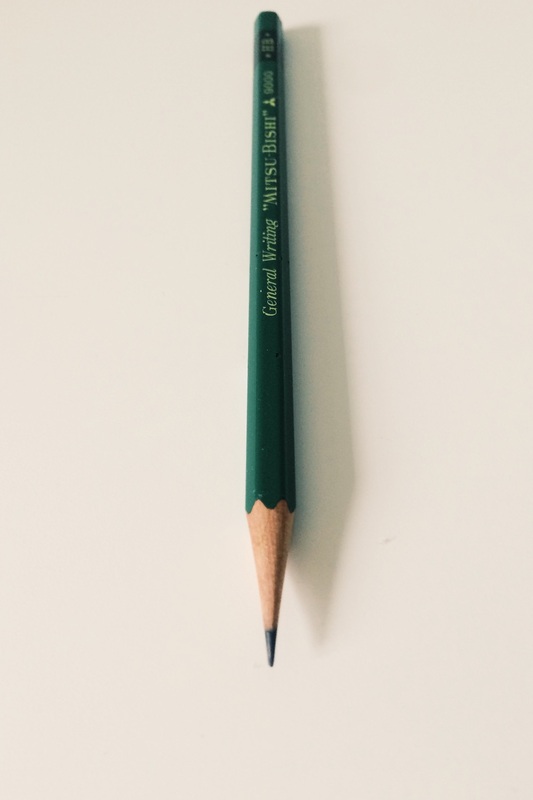 I have found that it holds a point well, important for long stints of general writing, the graphite in this pencil is lovely a dark, perfect for re-reading your general writing and it writes really smoothly, making general writing a breeze. In fact the smoothness of this graphite on the page is really noticeable and adds to the beauty of this pencil. I have used this on several different notebooks and paper stocks and I have found it a pleasure to use in all cases. On another side of the pencil barrel you have another note stating that the pencil is 'Made by Elaborate Process'. I really like the addition of this little note and Mitsu-bishi's sense of humour. I have tried searching online to find out what the elaborate process is but I didn't get very far with my research. This is my second Mitsu-bishi pencil. Previously I have used the Hi-Unis in a few different grades, all of which I have enjoyed. It seems from my experience that Mitsu-bishi generally make high quality pencils that write really well. I would highly recommend this pencil to anyone looking for high quality pencil that can be used for 'General Writing'.